Did you know that singer Tony Bennett had a near death experience, and that Mary Pickford, America�s sweetheart, regularly consulted a psychic? Have you ever experienced bilocation or wondered about the difference between clairvoyance, clairscentience, and clairaudience? 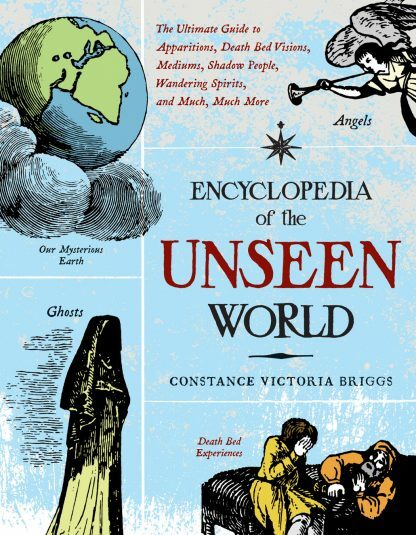 The Encyclopedia of the Unseen World delves into the world of the unseen and the unknown offering us an extensive A-Z explanation and exploration of the realm of ghosts, psychics, the afterlife, and more. From Sylvia Browne to visitations, gnomes and fairies to the devil and God, The Encyclopedia of the Unseen World offers a trip into the fascinating realm of the world beyond the known. Learn about prophets, mystics, and mediums past and present, key terms of the world beyond the veil, and the practices and divinatory arts that have been used for centuries to tap into that world. The appearance of the astral body in several places at once. This phenomenon has been reported for centuries. There have been reports from families and friends who were close to a deceased loved one that received simultaneous visits from that loved one on opposite sides of town or opposite sides of the world, with both visits being completely real and completely unique. In addition, bilocation can also occur when a person is astral traveling or having an out-of-body experience.